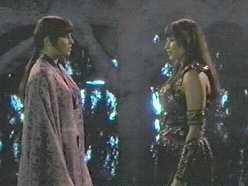 Xena confronts her doppleganger in DREAMWORKER. The conflict between Good and Evil is one of the basic elements in Xena: Warrior Princess (XWP). This conflict is by no means unique to this show, it is an element of many things. However, seldom do we have the concepts of good and evil examined as closely as they have been in XWP. In classical Greek thought, being good was to obey the Gods, which was in essence to obey the State. The view of the Gods in XWP is somewhat different, and we see being good as treating other people well. When we are introduced to Dahak, we are introduced to Zoroastrian dualism. Zoroastrianism is an ancient religion that originated in Persia. Its central feature is a conflict between two equally powerful Gods. Ahura Mazda is the God of Light. Angra Mainyu is the God of Darkness. These two Gods are engaged in a struggle, with the Earth as the battlefield. The chief prophet of Zoroastrianism was named Zarathustra (Zoroaster in Greek). He was a prophet of Ahura Mazda, not a follower of Dahak. Dahak was the name that was given on XWP for Angra Mainyu. In Zoroastrianism, there is no middle ground. One must triumph, and the other must be destroyed. Since these two Gods are of equal power, humanity, despite being vastly less powerful, is what tips the balance. This raises the importance of humanity tremendously. Zoroastrianism also forces a strict separation of Light and Darkness. Light is considered Good, and Darkness is considered Evil, which is still a common distinction. However, we are exposed to two characters who challenge this notion. Najara is a follower of the Light, who, while presumptively sincere, uses the Light for anything but Good purposes [ CRUSADER (76/408)]. Aiden, in PARADISE FOUND (81/413), also uses the Light, but with malevolent purposes in mind. Gabrielle tends to fall for such people, seeing the Light in them, and initially thinking them to be good. This is the mindset that Gabrielle grew up with, and it often takes a great deal to shake such deeply ingrained notions. From the perspective of Zoroastrian dualism, evil darkness sounds like an oxymoron. However, we are also shown a different model, Hindu non-dualism. In this model, Light is Light, and Darkness is Darkness. Light might be good, or it might be evil, and likewise with Darkness. Where Zoroastrianism only has a creator and a destroyer, Hinduism adds a third entity -- a Preserver. The three major deities of Hinduism are Brahma, the Creator; Vishnu, the Preserver; and Shiva, the Destroyer. This allows balance -- a stool with three legs may balance, but a stool with two legs cannot. Xena is another contradiction under the Zoroastrian model. She is clearly a potent force of darkness; however, it would be difficult to call her evil. Xena's transformation was not turning from darkness, but turning from Evil. However, under the Hindu model, there is no such contradiction. Xena's darkness is what is needed to defeat evil, as seen when Xena becomes Kali. Gabrielle can best be described as Light. All Light and no Darkness can be as bad as all Darkness and no Light. We are shown signs that Xena and Gabrielle have come to terms, or at least begun to, with the light and darkness within themselves and each other. Each depends on the other to keep them from straying too far. Dualism leads to the notion that if we do not agree, then one of us must be wrong. A non-dualistic model leads to the notion that the same "path" is not going to work for every person, much as it takes many ingredients to make a meal. I'm a 35-year old computer programmer living in Minneapolis. I started out watching Hercules because it came on after X-Files. I watched Xena because it came on after Hercules. Before long, I was truly hooked on Xena. I am a member of the "Xenaversity of Minnesota" (members.tripod.com/Xenaversity), a local Xena fan club. I would like to thank the Ontario Consultants on Religious Tolerance (www.religioustolerance.org) for the information on Zoroastrianism that I used for this article. First episode seen: I don't recall the first episode. It took a few episodes for me to become a Xena fan. Least favorite episode: I'd rather not single out an episode - it might be someone else's favorite!